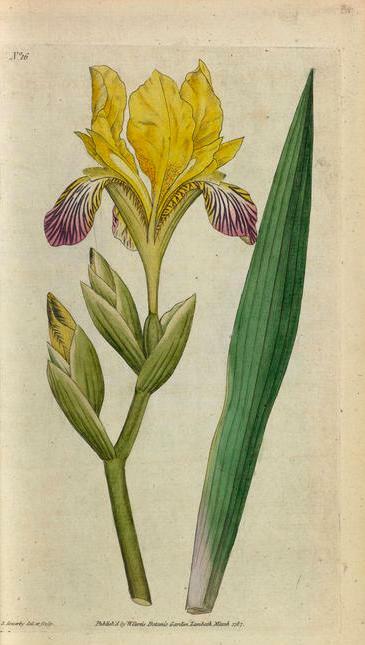 This standard, dwarf bearded iris does not in fact have variegated leaves, as the Latin name seems to suggest, but the flowers are bicoloured. Iris variegata and the many hybrids and cultivars derived from it are widely grown as ornamentals. It has striking flowers with bright yellow standard petals and veined cream and purple falls. Grown in western Europe since the late 16th century, it is a parent of many of the most colourful modern bearded iris cultivars. Iris variegata has striking bicoloured flowers and is the source of many of the most colourful bearded iris cultivars. Native to the area stretching from central and south-east Europe to Ukraine, Iris variegata is found in Austria, Czech Republic, Germany, Hungary, Bulgaria, Montenegro, Romania, Serbia, Slovakia and Ukraine. It is naturalised in Switzerland and Italy. 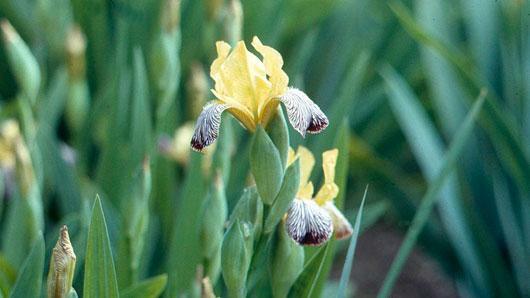 Overview: Iris variegata has a tuberous rhizome (underground stem) with fleshy roots. Leaves: The deep green leaves are sword-shaped, slightly curved, 1-3 cm wide and around 30 cm long. Flowers: The flowering stems are 20-45 cm high and are branched, with 3-6 flowers. Each flower measures 5-7 cm across. The standards (inner tepals) are yellow and the falls (outer tepals) are white to pale yellow, with red to purple veins sometimes fusing into a purple blotch, pointing out at an angle from the stem. The style branches and beard are yellowish. Seeds: The seeds are flattened. Iris × germanica (dingy flag iris) is a low-growing bearded iris, similar to some of the modern dwarf bearded cultivars, such as 'Langport Wren'. 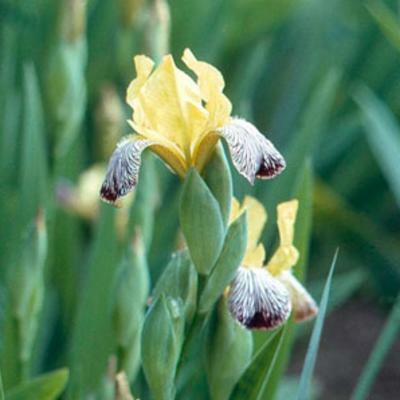 It is a hybrid between Iris variegata and the blue I. pallida , and is sometimes found wild where the species grow side-by-side, for example in northern Italy and Croatia. These hybrid swarms produce plants with flowers which show a great range of colours. This variation has been exploited by iris breeders to produce many cultivars of different sizes and colours. Iris × germanica has a tuberous, shortly creeping rhizome (underground stem). The leaves are sword-shaped and are usually curved. The flowery stems are around 30 cm tall and are branching, with several flowers. The flowers appear in shades of purple or reddish-brown. The standards (inner three tepals) are upright, and the falls (outer tepals) are deflexed to horizontal. The styles are petaloid and curve downwards, hiding the stamens. The capsule has three locules (small cavities) and numerous flattened seeds. Iris variegata is cultivated as an ornamental. Iris variegata is easy to grow and should be planted in a well-drained, sunny spot. It will benefit from being replanted in fresh soil every third year. Iris variegata can be seen growing in the Rock Garden at Kew. Pressed and dried specimens of I. variegata are held in Kew's Herbarium, where they are available to researchers by appointment. Stony slopes and open woods. 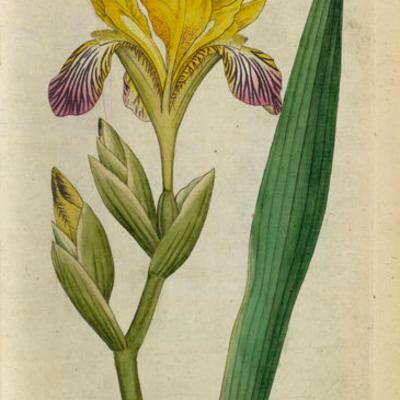 All parts of both wild and cultivated irises are poisonous, especially the rhizomes (underground stems). Williams, C.A., Harborne, J.B. & Colasante, M. (2000). The pathway of chemical evolution in Bearded Iris species based on flavonoid and xanthone patterns Annali di Botanica, n.s, 58: 51-58.
Cooper, M.R. & Johnson, A.W. (1998). Poisonous Plants and Fungi in Britain. 2nd Edition. The Stationery Office, London. Mathew, B. (1981). The Iris. Batsford, London. Curtis, W. (1787). Iris variegata. Curtis's Bot. Mag. 1: Plate 16.